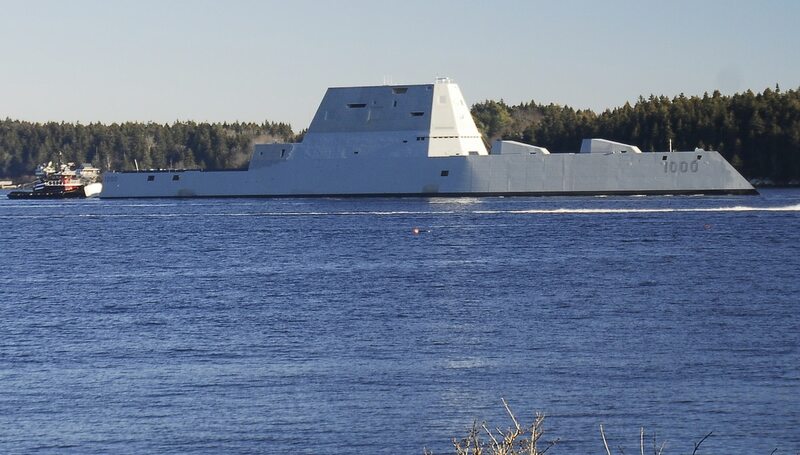 ARLINGTON, Va. — It’s been more than a year since the Navy decided to cancel procurement of an expensive new ammunition for its Zumwalt-class destroyers, but the service is still pondering how to best replace the munition, a Navy official said Wednesday. In 2016, the Navy decided to stop buying the Long Range Land-Attack Projectile, or LRLAP, after discovering that its price had spiked to $800,000 per round. LRLAP was the only ammo developed specifically for the ship’s Advanced Gun System. The problem, sources told Defense News then, didn’t lie with manufacturer Lockheed Martin, but with a program of record that decreased to three ships, making it impossible to benefit from economies of scale. While the service is keeping an eye on a couple key technologies that could fill in the gap left by LRLAP, “there is not a plan right now for a specific materiel solution for the replacement round,” Capt. James Kirk, the former commanding officer of the destroyer Zumwalt (DDG-1000), told reporters at the Surface Navy Association symposium. Click here to read more from the Surface Navy Association symposium! “We continue to monitor industry’s development and technical maturation. An example of that is the Hyper Velocity Projectile,” he said, referring to a high speed guided munition made by BAE Systems and originally developed for use in electromagnetic rail guns. Barely two weeks after the US Navy commissioned its newest and most futuristic warship, armed with two huge guns that can hit targets 80 miles away, the service is moving to cancel the projectiles for the guns, citing excessive costs that run up to $800,000 per round or more. Some of the delay could be due to a recent study by the Zumwalt requirements evaluation team, which re-evaluated how the Zumwalt-class could best meet the Navy’s operational needs. Based on the recommendations of the team, the service plans to shift the core mission of the ship from supporting ground forces close to the littorals to striking other surface vessels, Kirk said.